Making sure ITC isn’t spewing toxic fumes doesn’t require fining it out of existence. It requires a serious commitment to safety and transparency, which are sorely lacking in this state. The Texas Commission on Environmental Quality has a history of lax monitoring and enforcement. And Texas has refused to require widespread public disclosure of chemical inventories and Risk Management Plans of facilities that would improve journalists’ ability to inform the public during a crisis. A reporter who wants to see a facility’s RMP has to make an appointment with federal marshals to view it. Patrick Jankowski, senior economist with the Greater Houston Partnership, told business reporter Jordan Blum: “We need these facilities here because it’s how we get our products to market. Of course. But what is a booming economy without quality of life? Without peace of mind? 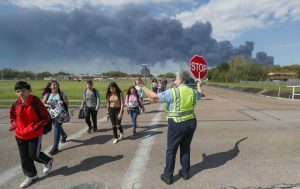 Parents sent their children back to Deer Park and La Porte ISD schools Tuesday, but they couldn’t have felt great confidence when school officials restricted outside activities. Houston ISD took the same precaution. Good to err on the side of safety, but no parent should have to fear that just walking to school might endanger their child’s health. Nothing that calls for fatuous comment or commentary. It’s just a situation reduced to its plainly naked reality. Companies do what they want, the public has no say. Regulations are too onerous. We need these companies here for our products. And what’s up with the air? One of the world’s largest renewable energy projects, largest project’s period, was constructed in the 1930’s. The Grand Coulee Dam. Not without controversy, it was also the beneficiary of some terrific luck when, with the attack on Pearl Harbor and outbreak of WWII, President Roosevelt and other supporters looked like geniuses for having had the foresight to push through such a crazy-expensive project. Hydro-electric power from the dam made possible the building of planes by Boeing and ships in Portland, not to mention the transformations of Seattle and Portland from outposts into major Northwestern cities. This, really well-done, documentary tells a lot of the story, including choice bits about Woody Guthrie being paid to come up with promotional tunes for public energy (!) [who has that gig now?] and environmental consequences like the interruption of salmon runs on the Columbia River, the restoration of which have been probably more feel good and window dressing for preserving regional identity than anything. Anyway, recommended.